The problem of the small-scale yielding (SSY) plane-strain asymptotic fields for the interfacial free-edge joint singularity is examined in detail, and comparisons are made with the interfacial crack tip. The geometries are idealized as isotropic elasto-plastic materials with Ramberg-Osgood power-law hardening properties bonded to a rigid elastic substrate. The resulting fields are shown to be singular and are presented in terms of radial and angular distributions of stress and displacement, and as idealized plastic slip-line sectors. 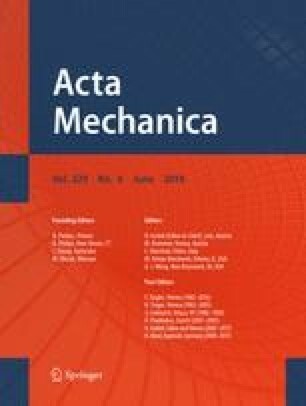 A fourth-order Runge-Kutta numerical method provides solutions to fundamental equations of equilibrium and compatibility that are verified with those of a highly focused finite element (FE) analysis. It is shown that, as in the case of the crack, the asymptotic singular fields are only dependent on the hardening parameter and only a small range of interfacial mode-mix ratios are permitted. The order for the stress singularity may be formulated in terms of the hardening parameter and the elastic solution for incompressible material. The rigid-slip-line field for the interfacial free-edge joint is presented, and it is shown that there is some significant similarity between the asymptotic fields of the deviatoric polar stresses for the joint and the crack-tip having an elastic wedge sector.